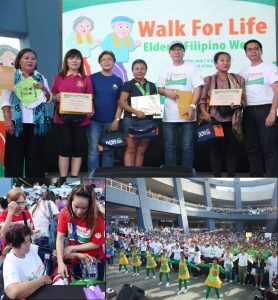 DSWD Assistant Secretary Aleli B. Bawagan (4th from left) and Protective Services Bureau Director Pacita Sarino (3rd from left), with the representatives from the different local government units, during the Walk for Life, kick-off activity of Elderly Filipino Week, held at SM Mall of Asia Music Arena on October 1. 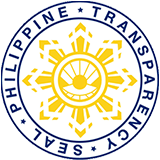 Aside from the 17 LGUs of NCR, the event was also participated in by senior citizens associations and national government agencies. After the walk, medical services such as consultations, random blood sugar screening, cholesterol screening, bone scanning, blood pressure measurement and vaccination were provided to older person participants. PhilHealth also set-up service desks to answer queries, accept member data amendment requests and distribute the new PhilHealth ID to senior citizens. Walk for life was held simultaneously in SM Malls in CAR, Regions, I, II, III, IV-CALABARZON, IV-MIMAROPA, VI, VII, X, XI and XII. An estimated 11,000 participants joined the simultaneous conduct of Walk for Life.